The road between Roujan and Neffies, two nearby villages, is typical of many in this region – lined with plane trees. Planted in the early 19th century on the orders of Napoleon to provide shade for troops and travelers moving through this sun scorched area. They’re also convenient for watercolour artists. This tutorial shows you how to capture this shady scene. Painting in France: Holidays and Workshops this summer. 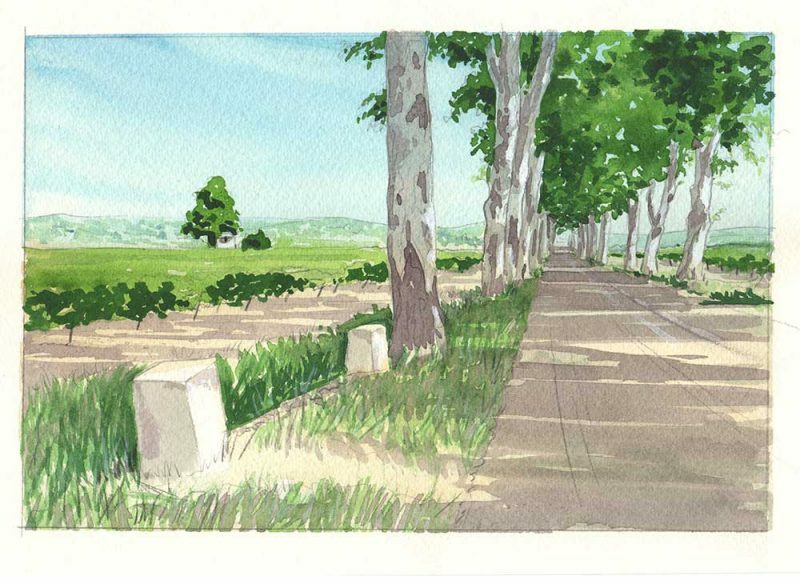 Le Pont Vieux, Beziers – a watercolour painting tutorial. Painting in France: Béziers – a new painting location? Vines in the snow. A study in Paynes grey. Painting in France: The art of Travel journals.